1. Apply base coat and cure. Apply two coats of black gel-polish and cure after each application. Using Wildflowers Nails Guide Plate #1, stamp a five-pointed star on the nail. 2. 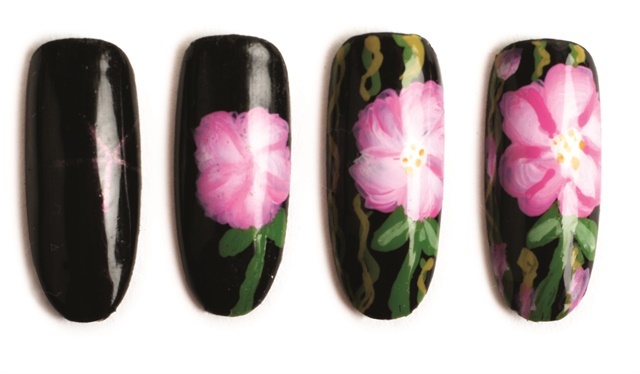 Fill in the flower design using Lauren Wireman’s one-stroke technique. Add the steam and leaves to your creation using Wildflowers Butter Paints, Art Paints, or a combination of the two to achieve your desired color. 3. Accent the center of the flower and the leaves, and add vine-like tendrils using Wildflowers Butter Paints and/or Art Paints. 4. Create lengthwise one-stroke flower buds randomly along the tendrils as desired, then accent with the same color used to create the large flower. Finish with top coat and cure.